I have mentioned the Boston Globe's online picture essays before but this study of the student protests in London takes some beating. Nice to know that interviews with would-be journalists in America are broadly the same as over here. This short film made me smile. If you enjoy it there is an earlier one on travel writing. For the last three years I have written a column for the Press Gazette aimed at regional newspaper editorial managers. Each edition it covered a different issue facing editors and how they might deal with them. They included conflict, dealing with difficult people, managing change, recruitment, technology, redesigning the title, sorting out the technology, running the budget and the like. It is a sign of the times that I covered redundancy three times - and was asked by one newspaper group if they could use one of the articles as its guidelines for all managers. The column has now run its course. I have exhausted my supply of tips (some of which are included here). So the last column appears in the magazine this month. I will be making occasional appearances in future. In the meantime, good luck to editor Dominic Ponsford and his team. By not relying on the newspaper industry for its revenue, the magazine is now more forthright and direct than it has ever been. It certainly isn't afraid to ruffle feathers - and is all the better for it. Here is my last column. 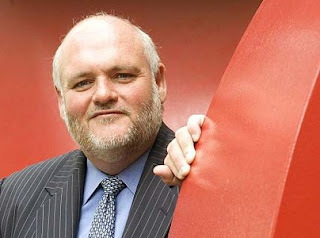 As we lurch towards a new year, the regional newspaper industry is desperately looking for a flicker of light at the end of what has been a very long and very dark tunnel. But most of the editors I speak to are, quite sensibly, steeling themselves for more of the same. So in this, my final regular column, I offer ten tips for those of you still editing regional titles in 2011.
i) Whatever gets thrown at you - the editor's core job remains the same. Set a vision for the title, tell everyone what it is and give them the skills and motivation to deliver it. over a difficult period with dignity and integrity? iii) You are only as good as the people around you - motivate and reward the key players. finally bring in more sits vac and ROP will lead only to tears. It may be time to take charge. v) Continually revisit your content. Set standards and give feedback - protect regular slots to talk to your team about the title; what is working, what isn't and what you want changing. vi) The atmosphere in the newsroom is down to you. I go into some offices that are like libraries, others that are vibrant. That doesn't happen by accident. vii) Protect your staff, your title and yourself from outside fads and decisions - including those of the company. viii) Look after yourself - it is a stressful time and I see editors who don't look as fit and perky as they did a year or two ago. It is too easy to get into the habit of always tackling that extra job or clearing the decks for tomorrow. Stop. Go home to the family, or to the pub, and make sure you get your quota of sleep. A stressed out and burnt out editor is no good to anyone! ix) Be prepared for the curve ball ... you may have dealt with just about everything in recent years but it isn't over yet. There will be further 'radical solutions' thrust upon you. That is certain. But there may also be opportunities. If a buy-out comes your way, how are you placed? If the next round of ‘innovation’ involves culling editors, how well are you protected? x) Know when to draw a line in the sand. If you fundamentally disagree with the company and you cannot change it, if the job is making you and your family unhappy, then know when to say enough. Your currency in the outside world is higher than you think. The skills that journalists take for granted are very marketable - even in this climate. There is life after editing (trust me on this one). It is 21 years since I took my first editor's chair. It had its moments - a press that let the paper down, a sabre-rattling union, a round of redundancies - but it was a walk in the park when compared to editing today. There are many of you, I know, who do it really well under extremely tough circumstances. Good luck … you deserve much better. 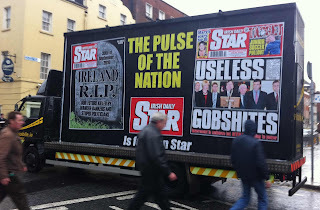 Nobody could ever accuse the Irish of not telling it like it is. Plain-speaking is a characteristic of the people and, naturally, of their newspapers. I have already referred to the Daily Star's direct front page on the budget. 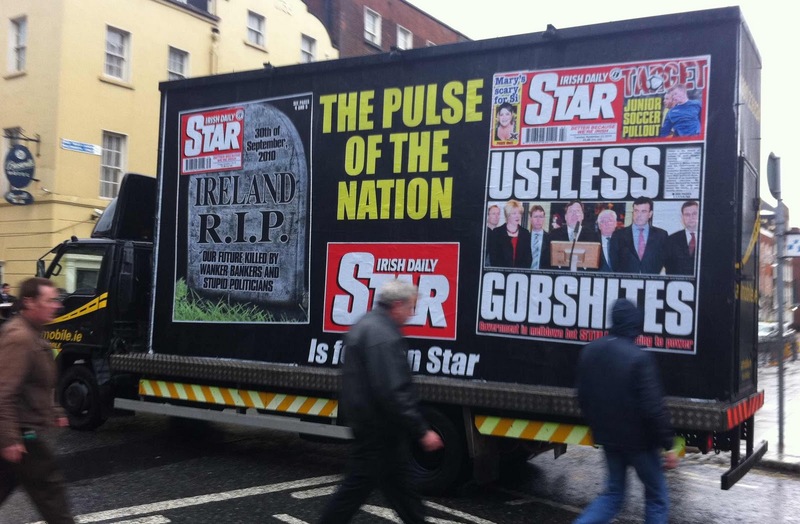 But not content with the word gobshites in 187pt caps on the front page it has now blown up the page and stuck it - along with another front page which refers to wanker bankers - on the side of its promotional Star truck in Dublin. Thanks to Fiach Kelly for the picture. And here's another down-to-earth assessment of Ireland's financial position. I have no idea if it was broadcast but it's funny nonetheless. Meanwhile the Irish Examiner took a more satirical approach to promoting its Budget coverage. All credit to them. Even faced with financial meltdown, the Irish sense of humour remains irrepressible. Personality politics and ridiculing public figures purely because of their appearance. Disgraceful. 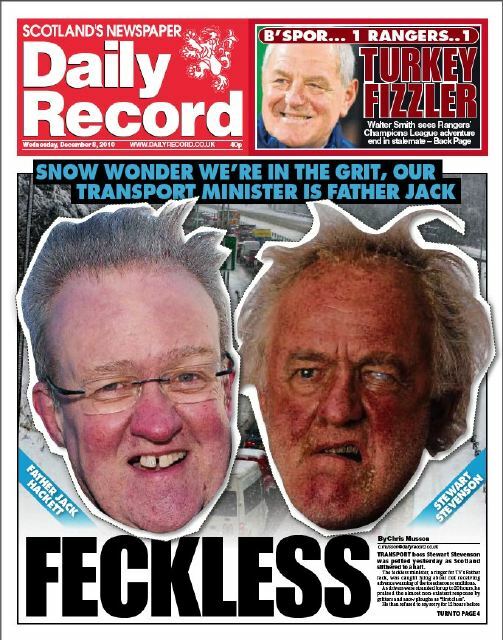 That said, the front page of the Daily Record today is really quite funny. Thanks to Mike Lowe for alerting me to this one. Had a call from the Halifax Courier's Tim Robinson this week asking about body copy. Tim is a self-confessed Times New Roman junkie but was asking about accessible alternatives. "Please don't say Nimrod - to me it looks as up-to-date as the ad for Worthington E," he added. Times New Roman is OK if used properly. It has served newspapers well, commissioned specifically for The Times newspaper in 1931 (although even The Times doesn't use it any more). Times and Times New Roman have a smaller x-height than many other serifs and have thin strokes and hairlines, so has a tendency to break up if used too small on newsprint. 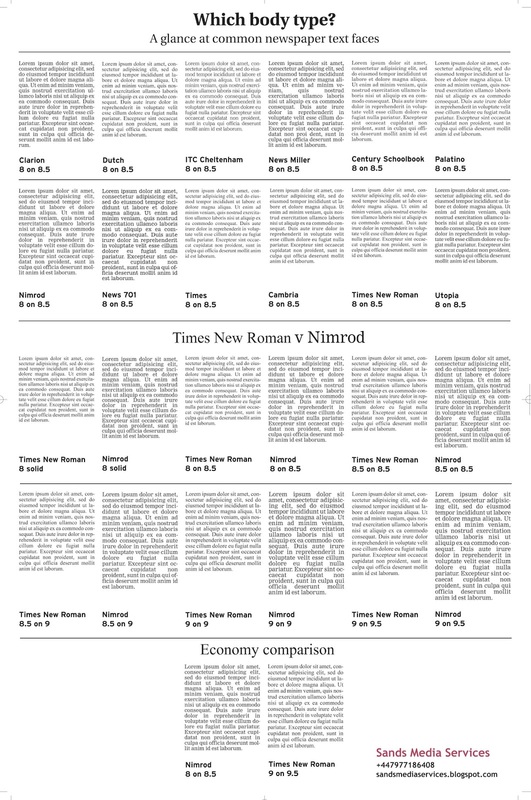 I regularly see research which says readers find a newspaper difficult to read - and more often than not it is Times or Times New Roman used at 8.5pt or under and across too narrow a measure. As it has a small x-height you don't really need to lead it, just use it bigger. Nimrod is certainly ubiquitous and hardly at the cutting edge of design but it is functional and readable. Clarion is very similar to Nimrod. News Miller and News 701 are very readable. If economy is more important, ITC Cheltenham works well. Newspapers tend not to be awash with great off-the-shelf serifs ... some of the most stylish fonts, such as Poynter and Gulliver, can be costly. And not many newspapers are in the business of buying in new fonts these days. 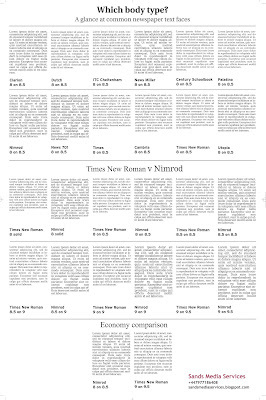 I put the above chart together for Tim which compares common text faces and specifically looks at Nimrod v Times New Roman. It's a jpg but if you would like a better quality PDF drop me an email on petersands@mistral.co.uk and I will send you one. Don’t transform from broken. Start again. just lousy journalism in multiple ways. Here are some inspiring bullet points from a presentation by John Paton, the chief executive of the Journal Register Company, delivered to the INMA Transformation of News Summit today. When you have an hour take a look at the full presentation. You don’t transform from broken. You don’t tinker or tweak. You start again. You can build a new and better house from the foundations of the old. Pushing print onto digital only makes for a lousy experience. Lousy journalism on multiple platforms is just lousy journalism in multiple ways. 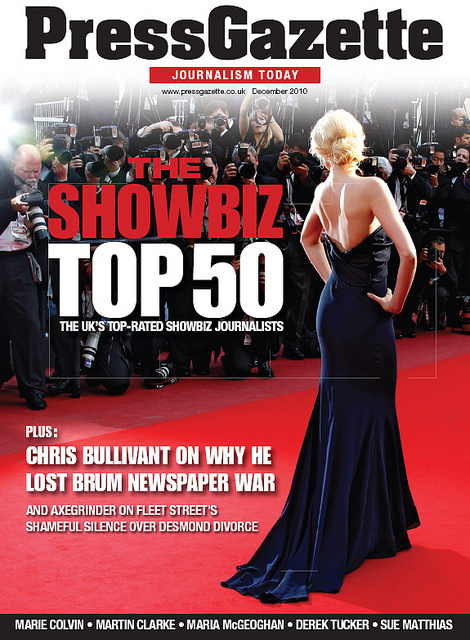 Compelling journalism is key to standing out and it is the power of our brands – our reputation – that can spotlight for our audience where they should look for journalism they can trust. Two-thirds of a newspaper’s costs are infrastructure – stuff you don’t want to do – and NOT in what you do want to do such as create compelling content and effective sales. Decide what you will no longer do – our core competencies are content and sales – we are getting others to do everything else. There are now companies who do most of this much better than any newspaper company does no matter what their head of pre-press or production says. Because those ARE the core competencies of the outsource companies. The reasons (we are not seeing a complete overhaul of newspaper business models) are: Fear, lack of knowledge and an aging managerial cadre that is cynically calculating how much they DON’T have to change before they get across the early retirement goal line. Look at the grey heads in any newspaper and you will see what I am talking about. If Print dollars are becoming Digital Dimes, then we better start chasing the Dimes. And we better do it cost effectively. Stop focusing on the Print. It is in any newspaper’s DNA. It is not like you are going to forget to put out the newspaper. The industry has only focused on cost reductions. But it is a focus that says do more of the same with less which results in the same done worse. And it is prolonging the death of a broken business model rather than adapting to the realities of the present. We have had nearly 15 years to figure out the Web and as an industry we newspaper people are no good at it. No good at it at all. Put the Digital people in charge – of everything. At JRC we have instituted a Profit Sharing Plan. If the Company Wins, the Employees Win. We all Win. As CEO, I blog to my employees and the public. I ask for their help and they oblige. I also regularly email my 3,106 employees and they me. The Register Citizen’s new offices will be without walls and invite the community in. It will feature a newsroom café with free public wifi, a community media lab, a community journalism school and the Register Citizen will open up its archives of 120 years of local history to the community. We will no longer be dependent upon out-of-date thinking. And we will no longer be dependent on costly systems that are outdated before they are even successfully installed. Here is the full presentation ... it is a must-read. Clever video extols the virtues of Neutra Face. More classic typography funnies can be found here, here, here and here.